For centuries, bridal tiaras have been worn by brides during their wedding ceremony. Their choice in type and style of the tiara would vary depending on the theme of the wedding. Exclusive and unique tiaras add regal elegance to the brides overall look, which heightens the grandeur and attraction of the bride, making her even more beautiful and irresistible to the groom. Tiaras and diadems date back to ancient times, here's some history on their origins. The purpose of a crown or tiara has always been, to portray the wearer as someone special, someone ordained by the gods. Those origins are as ancient as society itself, and every culture had some form of headdress or crown. The ancient Egyptian pharaohs wore a triple crown demonstrating the unity of the culture, while the Assyrian kings wore a headdress featuring bulls horns and feathers. The term `tiara' originates in ancient Persia, where only the king was allowed to tie his tiara up so that it stood erect. It was tall and conical in shape and richly ornamented with jewels. Later papal tiaras had a similar shape. 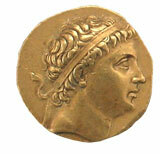 In ancient Greece, a diadem (from `diadeo' to bind around) was originally a white ribbon bound around the head. Several of the Greek gods have been portrayed wearing diadems on frescos and pottery and not surprisingly, the Greeks dressed divine statues with them and even awarded them to star athletes. Throughout the classical period, when monarchies or tyrannies in Greece were regarded with some distaste, so when certain generals took to donning diadems or (even worse) Persian dress, they were regarded as upstarts and dealt with harshly. In the fourth Century BC with the failure of Athens, and the rise of the Syracusan tyrants and later Alexander the Great, the democratic experiment was over and absolute power was concentrated in the persons of Alexander and his heirs. They all donned Persian dress and wore diadems dressed in gold and precious stones. The Roman republic had a similar distaste for kingship and the wearing of a diadem or tiara (by then, the same thing) was banned. Even Julius Caesar - after he had defeated Pompey and the Senate and established his dictatorship, didn't feel secure enough to accept the proffered crown and accepted a laurel wreath instead. It wasn't until the fourth century AD, with the complete subjection of the Senate and people, that emperors began wearing a diadem. By the time Roman authority was finally extinguished in the west, the tiara or crown had become a symbol of royal authority. The oldest known Christian crown in Europe was the iron crown of the Lombards. It was made (it was claimed) from one of the beaten down nails from the Cross and was decorated with gold and jewels and crowned the heads of kings for over a thousand years. Like many crowns of the Christian era in Europe, it was a circlet, without arches or cap. A `coronet' as it's name implies is a small crown. Unlike a crown, it never has arches and consists of ornaments fixed to a metal ring. After the fall of Napoleon, jewelry on both sides of the channel became more extravagant and some of the finest tiaras were created at that time. In the nineteenth century and the rise of democracies and the nouveau riche, the wearing of diadems and tiaras shifted from a political to a fashion statement. For the new upwardly mobile classes, the tiara became a `must have' addition to the female wardrobe for social events. Not surprisingly, this period marked the rise of the wedding tiara. After World War I, the tiara gave way to the headband (bandeax) and fascinators(aigrettes). The influence of motion pictures saw the tiara made a comeback in the 1930's before the enforced austerity of World War II set in. In the 1950's, the new media of television and magazines saw the return of the tiara, especially as a wedding ornament. The modern tiara or diadem is generally a half crown placed over the forehead and decorated with crystals, pearls and semi-precious stones. Modern designers place more emphasis on design than the value of the gems, so the cost of a wedding tiara is now within the reach of most people. The modern tiara can be worn at social events such as weddings, balls, proms, debuts and beauty pageants. Some are even converted to stunning necklaces or kept as family heirlooms.